Did you know that you can share a YouTube video at a specific time? Why Should I Learn How to Create Links to Start and End a YouTube Video? Linking to a particular time in a video can be really helpful and be very effective in presentations when you want to refer to something very specific. You can also use it to show a certain part of a compilation video. YouTube is famous for allowing users to gather short snippets of related videos and putting them into one big collection. You will get a new link that looks like this. The second part is important to note, because that’s how YouTube recognizes where you would like to start the video. In the example above, the video will start at the 15-second mark; ‘t’ is the variable for the ‘time’ to start the YouTube video. That said, you can now refer to a certain segment in a YouTube video where it can both start and end at a certain time. Step 1: Click on the original YouTube URL. (At this point, you now have an updated URL that works again. However, you still need to add the start and end times in the end. Step 4: Add ‘?start=&end=’ at the end of the URL. Step 5: Calculate the time intervals for the video. Step 6: Add the time intervals to your YouTube URL. Step 7: Check to see if it works! 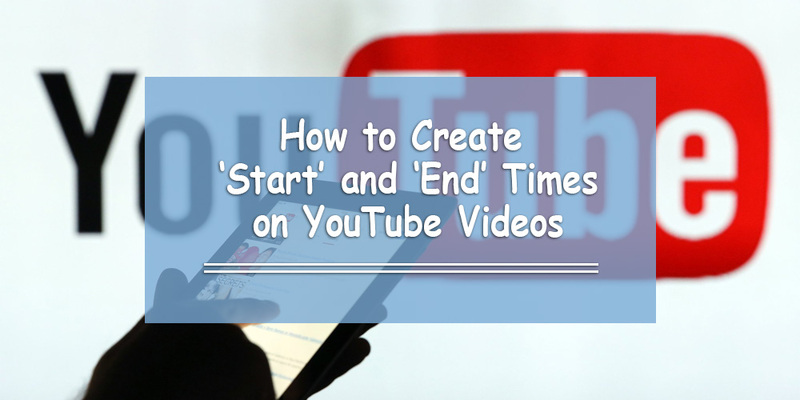 So, now you know how to create your own ‘Start ’and ‘End’ times for the YouTube videos you watch! So next time you want to use a YouTube video for one of your presentations, or want to share a YouTube video with a friend via email or social media, refer to this cool trick. It will save them a lot of time and will let them know exactly what you wanted them to watch. I am having trouble following the steps. For the following youtube video, I want it to start at 73 seconds, and end at 94 seconds. Would you please put it into the correct format? Once I see the before and after URL, I will understand how to do this for myself. That’s weird. I just tried it myself. Apparently it doesn’t work with /v/ anymore. There is another way to do it, and it has since been updated in the article. including the modified URL would have been helpful. Procedure doesn’t work! Can you put this link in the write format. I want it to start at 2:59 and end at 3:12.